Brian from Advanced NFL stats recently posited that some NFL teams (namely, the Washington Redskins under Jim Zorn) might have been throwing too few interceptions. This was because the lack of interceptions was a symptom of playing too conservatively, and therefore costing the Redskins games. Implicit in Brian's thoughtful article are a couple of assumptions that I want to unpack, because radically different strategies might be appropriate depending on the level of football. The first assumption is that a lack of passing (or passing aggressively) costs the offense points. This is undoubtedly correct: on average, passes garner more yards per play than runs, and an equilibrium playcalling strategy will seek to maximize the returns for each play (whether in terms of yards, first downs, or points). The second assumption appears to be that maximizing yards and points is the optimal strategy for an offense. Hence, the lack of interceptions means that the team is leaving points on the board, thus costing it games. This is the assumption I want to address in slightly more detail. Is it always "optimal" to set your strategy to maximize points scored? In the NFL -- which is what Brian focuses on -- this is likely true and the assumption holds. NFL teams are almost all competitive with each other, and even the worst teams can beat the best in a given game. So any reduction in expected points is likely to hurt a team's chances of winning because they need to maximize that out to get wins. But is that true in college? Or in high school? Think about when Florida plays the Citadel. The Gators have a massive talent advantage compared with the Bulldogs. As a result, what is the only way they can lose? You guessed it: by blowing it. They can really only lose if they go out and throw lots of interceptions, gamble on defense and give up unnecessary big plays, or just stink it up. The upshot then is that, for the storied programs with large talent advantages, there is seemingly more downside than upside to being very aggressive, either on offense or defense. While it might increase the risk of blowing the opponent out, it also increases the risk of stumbling. Let's take a quick step back and talk about what is happening from a probability standpoint. What does a more aggressive (and thus more risky) strategy do to our expected outcomes? Hopefully everyone is familiar with the bell-curve, which is a graphic way of depicting the range of possible outcomes based on the probability of their occurrence. The normal distribution is the most common, and it assumes that outcomes on the left and right are as likely as the average outcome. Here, let's assume this is the curve for an offense that can be expected to score around 28 points a game. Now, let's say they decide to ramp it up. They want to score more points, but this is a riskier strategy, and therefore the range of outcomes will vary more wildly. Below is the new curve, which has moved to the right (to reflect the greater expected points) but is also flatter -- a measure of kurtosis -- which makes the "tails," or ends of the curve "fatter." What does this tell us? It really just reaffirms what we'd already guess (and assumes that we know what strategies are both riskier and more rewarding, which is an assumption but generally involves passing more). Our offense now: (a) averages more points, (b) has an increased chance of scoring in the forties and blowing out the opponent than before (represented by the shaded green area), but (c) has an increased chance of blowing it and scoring fewer points than our more conservative -- and less variant -- strategy from before. Hence, you might maximize your points but you might actually increase your chance of losing in the process. Now, remember I'm making assumptions about the nature of the curve. There's also a probability phenomenon known as skewness, which might mean that the improved strategy actually will rarely ever incur a bad game and all the variance will be good. But the reason I took this mathematical approach to this is that this is really the lesson of the financial crisis as applied to these Wall Street gurus, imported to football: you can "improve" your strategy, you can increase your expected gain, you can increase your chance of blowout wins, but in the process you might be sowing the seeds of your own unlikely, but catastrophic demise. Sort of Black Swans for football. So in the NFL, where teams are almost all competitive (save, maybe the Detroit Lions), it's likely the best strategy to simply maximize expected points and to go from there. But in other levels, with talent disparities of all sorts, it is trickier, as we have seen. On the flipside, almost every week of the season I see teams go to Southern Cal, LSU, or Ohio State, and pretty much give up all hope of winning in the name of "keeping it close and winning it in the fourth quarter." As outlined above, this might be the worst strategy against such teams. They have little chance of winning on the merits, so what they need to do is flatten the tails and increase the chance for a shocker: take risks, and hope their coin flips go in their favor. Maybe they won't. Maybe they get blown out. But not taking those chances is a surefire way to set their low chance of winning in stone. But there are real costs -- at least for the coach -- of getting blown out. And make no mistake, the bargain for a greater chance of winning includes the greater chance of getting thrashed. Maybe this should be irrelevant -- a win is a win and a loss is a loss. But a blowout loss has collateral effects, even if they are purely psychological and emotional. You can lose recruits, you can lose donations, and you can lose your job. Look at Mike Shanahan with the Broncos. He was on the hotseat, but he lost his job primarily because Denver got blown out in their final game. I don't necessarily think that was because his team took on increased risk, but people do not tolerate ugly defeats, rational or not. Similarly, there might be real gains for an underdog to just "keep it close" with a big boy without ever having a real chance of winning. People discount moral victories, but if such and such team can "keep it close" with USC, then they get all kinds of accolades and possibly even confidence going into the following weeks. But if they employed the risky-underdog strategy, then they might gain a slight marginal increase for a victory, with a steeper increase in the chance of getting buzzsawed right off the field (remember skewness). So, from the perspective of being purely focused on winning football games, I think the implications of the risky/conservative strategy dynamic in the context of teams with wide talent disparities has some pretty dramatic implications. But in the real world, there's lots of other factors, including the felt need by the coach to protect his own skin. Yet, he might be costing his team a chance at victory. The virus that infected professional baseball in the 1990s, the use of statistics to find new and better ways to value players and strategies, has found its way into every major sport. Not just basketball and football, but also soccer and cricket and rugby and, for all I know, snooker and darts — each one now supports a subculture of smart people who view it not just as a game to be played but as a problem to be solved. Outcomes that seem, after the fact, all but inevitable — of course LeBron James hit that buzzer beater, of course the Pittsburgh Steelers won the Super Bowl — are instead treated as a set of probabilities, even after the fact. The games are games of odds. Like professional card counters, the modern thinkers want to play the odds as efficiently as they can; but of course to play the odds efficiently they must first know the odds. Hence the new statistics, and the quest to acquire new data, and the intense interest in measuring the impact of every little thing a player does on his team’s chances of winning. In its spirit of inquiry, this subculture inside professional basketball is no different from the subculture inside baseball or football or darts. The key-stat that is used to evaluate Battier's importance is a modified version of the "plus/minus" stat first used in Hockey. The basic gist is one just looks at how good the team does with a player in the game versus out of the game -- i.e. how much do they outscore or get outscored by their opponents. Of course, the raw version of this stat is misleading, because all players from good teams would shoot up the rankings while those on bad teams, even excellent players, would fall far. Supposedly, the Rockets' manager Daryl Morey has developed this stat further, though is cagey about how. But he is quite confident that Battier has one of the best "plus/minus" values in the league. [A]s I said, I'm a bit skeptical, still. I accept that Battier must be exceptionally good at defense, since (a) he plays 33 minutes a game and doesn't have very much in the way of traditional offensive statistics; (b) the Rockets have watched him and studied him and think he's great; and (c) his teams have done well. Still, from a scientific standpoint, the article is mostly anecdote and hearsay. It shouldn't be all that hard to confirm the article's thesis and measure the size of the effect. If Kobe [Bryant] is good from one place but worse from another, that can be figured out by watching games and counting. If Battier holds him to those low-percentage shots when covering him, that can be counted too. 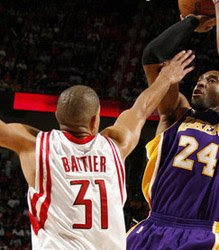 And at the most fundamental level, can't you see what Kobe (and the other players) do when covered by Battier, and compare to what they do against the Rockets when Battier's on the bench? Something is better than nothing. One answer might be that the evidence is there, but that it is still proprietary. That was Morey's answer in the Lewis piece. Nevertheless, this does indicate to me that people are on the right track in at least trying to really analyze sports, and not get bogged down in trivia. Earlier this week, [Mark] Cuban posted to his blog a list of the 30 NBA players who have the biggest positive impact on their teams when they’re in the game. They were ranked by a measure inspired by hockey’s plus/minus statistic, reflecting how well a team does with a player on the court, after accounting for the other players on the court with him. Cuban’s plus/minus adjusts for how good the team is without the player on the court as well as for the opponent and for game situations. (Without such adjustments, players on a top team like the Los Angeles Lakers would all look good, because the Lakers so often dominate.) . . . . I sent Cuban’s surprising ratings to Roland Beech, proprietor of the NBA stats site 82games.com, for comment. Beech works on player analysis for the Mavericks and incorporates a version of plus/minus into his own player ratings. But that didn’t keep him from criticizing the numbers Cuban posted. Cuban and Wayne Winston, who developed the system for him, responded. What resulted was a polite yet spirited debate among Cuban and his advisors about how to best analyze players. Beech told me he considered plus/minus ratings, as adjusted by regression analysis, “one of the most over-hyped player rating systems.” He pointed to the incongruous finding that [Sebastian] Telfair is more valuable than [Dirk] Nowitzki, and blamed other questionable results — San Antonio Spurs point guard Tony Parker as a below-average player — on a paucity of data on top players’ performance without their star teammates. 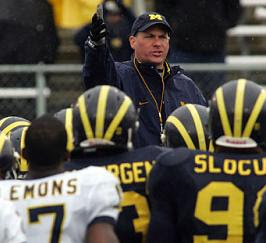 Beech also argued that there is too much noise in the system, because a player’s value is determined by coaching schemes, injuries and their assigned roles. . . .
Winston, the professor of operations and decision technologies at Indiana University who developed the system for Cuban, said that no system is perfect, but that plus/minus beats other player analyses because it can reflect defensive prowess — and Nowitzki’s defense was subpar at the beginning of the season. It’s with defense, Winston said, that plus/minus “really shines,” because defensive stats such as blocked shots, rebounds and steals can’t encapsulate a player’s worth. We still need more and more of this kind of development with football. At least they're trying. So it's gone. I have updated my original "A-11 Offense: A Pragmatic Approach" article to reflect this new development (I still get many hits and comments on that article). I have reprinted that discussion in this post for those who have already read the original. The A-11 has now been ruled illegal. The ruling is consistent with this piece: rather than aim directly at the offense or the formation, the National Federation of High School Athletics has clarified the scrimmage kick exception to be limited only to fourth down. As explained in the full-post, the A-11's creators, Steve Humphries and Kurt Bryan, had found a way to transform the scrimmage kick exception (which all agree was at least originally intended only for kicking situations) into an every down offense by putting the quarterback more than seven yards deep. The new ruling eliminates this by requiring that at least four players on the line of scrimmage wear an ineligible jersey number (50-79), except on fourth down. The A-11's creators have a few arrows left in the quiver. First, they have encouraged teams interested in the A-11 to break off from their state's rulemaking body to form a loose-coalition of A-11 teams, or all A-11 league for themselves. Doing so would require that those schools would not be eligible for their state playoff systems (because they would not be following the rules/procedures that other schools did) and would have to encourage the other, non A-11 league teams locally to play them using their brand of rules. This proposal has not been met with enthusiasm, to say the least.The other proposal they have floated, this time via email, is called "numerical camouflage." To me, part of this is an admission that the A-11 itself is not that innovative -- the major contribution Bryan and Humphries made was not the formation or the "super-spread," but was with toying with who was and was not eligible so as to confuse the other team (and officials). Basically, they would line up in the A-11 or old BYU type formations with three interior linemen, and give the eligible and ineligible guys similar numbers, like "68" and "88." This way they could still have everyone huddle up near (but not on) the line of scrimmage before the snap, and then, just like the old A-11, have some of them step onto the line and be set for only a second. Whereas with the real A-11 each would be potentially eligible (before being covered up), here, although it would be foreordained that 68 would need to be on and 88 off, the defense might not be able to determine who was wearing 68 and 88 until it was too late. Make of that proposal what you will, but they are certainly determined.In any event, it's slightly sad to see it go. I never had any animosity against the offense (certainly not against innovation and being spread), but the scrimmage kick exception was never the proper vehicle. Maybe football is moving the direction the A-11's creators say to being fully wide-open where linemen are a thing of the past, but why not do away with the eligibility restrictions entirely? Many states also have 8-man football leagues, which more closely resemble Arena football, which is itself something like what the A-11 proponents advocated for. Moreover, there was always so much confusion about the offense: so many thought that "A-11" actually mean that the offense could send eight, nine, ten guys downfield to catch passes, when the reality was that it only referred to what was going on pre-snap, and after the snap the offense had no more downfield receivers than the west coast offense or the wishbone. Maybe in the future we will continue moving that way, but it always struck me as bizarre that this was seen as some kind of ultimate and brand new innovation. As documented in the full-post, the actual formations have been around for fifty years, and the Canadians have been one-upping the A-11 since they can send six receivers out for a pass (rather than five as with every U.S. team, including the A-11), due to the fact that there are twelve players on each side. If we want to change the rules we ought to do it head on. The memory of the A-11 will not fade away, and flag, Arena, and Canadian football are constant reminders of what is possible, if it is true that football is inexorably moving in the direction of being all-spread, all the time. I for one disagree that this is the only direction football goes. It is more cyclical than that and linemen are not as useless -- or as uninteresting -- as the A-11's proponents seemed to argue. Moreover, even in the vaunted A-11 offense, the players who replace regular ol' offensive linemen are about as uselessly limited as can be: they stand on the outside of the formation and back up to possibly receive a lateral (which a lineman can currently do in any offense), but is otherwise purely a decoy. To me, the idea of the spread is to turn kids into threats by isolating them, moving them around, and unleashing them as downfield terrors. All too often, despite its "wide-open" appearance, the offense tends to restrict the number of eligible downfield receivers (because the running back is needed as a blocker with only three linemen, the offense routinely only can release four receivers downfield instead of five) and it turns players who can do multiple things to the defense -- yes, linemen -- into mere bystanders. That's not spreading; it's bad arithmetic. And that's not an argument against the spirit of the game or to persecute them, it's just that I don't think you gain a strategic advantage from the offense besides whatever deception you might get from confusing the other team about who is and is not eligible. But that debate is over for now, and will have to be taken up in the future. It no doubt will be. [Peyton] Manning's attack angle of his elbow allows his wrist to come through tighter . . . . That coupled with the accelerating torque of the turn, he gets power and accuracy on a more consistent basis [than most other quarterbacks]. Warner and Romo, can be very similar in their approaches. [T]he one who extends better than the other more consistently will overcome the[ir] flat release[s]. It still goes back to discipline, no matter how you slice. The biggest difference [between these quarterbacks] is that Manning has a bigger margin of error with his throwing motion. This means that he can fail at some part of his move and he will still have more room to recover in [his] extension -- simply because the "around" stress put on his elbow is reduced because his elbow location is better. This allow[s] arm extension to occur easier. The other thing to note, is Romo's increasingly curled wrist. [T]his weaker wrist position makes it much more difficult, if not impossible at times, [for him] to extend. You just cannot physically extend a curled wrist. So, the bottom line. Kurt [Warner] and Tony [Romo], due to their lower elbow positions, have less room to make mistake in their moves even though their elbows are still forward of the shoulders. This can result in greater failure [rates] if they do not maintain discipline in extension. Peyton has a much greater probability of success due to the reduced stress on his elbow, his better positioned tricep for extension, and his more vertical attack angle. Any pressure applied [by, for example, a pass rusher] may reduce some of Peyton's advantage, but everyone does less than they should under pressure, so the consistency, accuracy, and velocity advantage remains with Peyton. But hey, who is in the SuperBowl? So much for coaching, right? Now, the mistake here [for a young quarterback] would be to say, well, just get your elbow higher. That isn't the answer by itself. Peyton's elbow is not only higher, but more forward of his shoulder -- and that is where the rubber hits the road for muscular function . . . and that is why we teach differently than the common approach. To understand and apply [it] is to control the feel and self correction of flight. Why? because when you fail to get to zero [or the original position], no matter who you are, the resulting failure is consistent for everyone -- automatically, no matter what age, regardless of professional status, or skill. . . .
Just one final thought, the magic formula to all of this isn't rote visual copycat, it is understanding the timing and acceleration of the elbow, and how the feet and body support that. If you can crack the code on this, you will begin to appreciate the incredible difference you will see in your kids. . . . These guys are pros, so they just get it done. Our kids are not, but they need this understanding all the more, and dare I say it, so do many coaches. Slack knows what he's talking about. Some of his ideas are quite novel, while others are merely the best of what has been consistently taught in the past. The reason it works so well is that he has developed a language and teaching method to improve quarterbacks. I talk a lot on here about schemes, but you have to have a guy who can throw the ball accurately. If you have a John Elway, fine, but most quarterbacks are very poorly taught. And at the high school level, it is on the coaching to turn a guy who is a non-QB and turn him into one, to improve the mediocre quarterback, and to make the good ones great. I agree to a small degree with the "leave well enough alone," but that is also no excuse to abdicate duties. No one says about a lineman, "Hey, he's a natural. Don't tinker with him too much." But they say it all the time with quarterbacks. 2. Whither A-11? These are only rumors, but the rumor-mill is that the high school football federation rules -- which govern most but not all states (the others use NCAA-like rules) -- have settled on changing the rule governing the "scrimmage kick exception" to conform with NCAA rules. No big deal right? Well, if true (the results of the January meeting won't be public for a few weeks) it would mean that the A-11 offense, as currently used with extra eligible jersey wearing players lined up behind the line who then step up onto the line before the snap to disguise who is and who is not eligible, would be illegal in nearly every state and every level of football. The word further is that this has not made the A-11's creators, Kurt Bryan and Steve Humphries, very happy. Their proposal so far has been to encourage individual schools who want to run the A-11 to break off from their state football leagues (making them ineligible for state playoffs) and form a kind of national, A-11 compatible league. The details of such a proposal are manifold, but teams from different states often play each other, but they agree on the rules in advance (for example, cut blocking is illegal in many states but legal in Texas and some others). But these are usually exhibition style games, and it is a heavy price if a team is willing to secede and forego their own state playoff opportunities simply to run a particular type of offense. It's unclear how different the rules there would be, too. (If a new league, why not require only four ineligible guys and and another receiver truly eligible? You could run a five wide offense with a quarterback and a runningback.) I really have no news other than the rumor-mill (hey, what are blogs for? ), but it will be interesting to see how this develops. 3. NFL Overtime, Continued. Slate's "Undercover Economist" Tim Hartford has proposed that the team who gets the ball (and where) should be determined by auction. For example, the referee could start naming off yard lines. He'd start at the one and keep moving up. 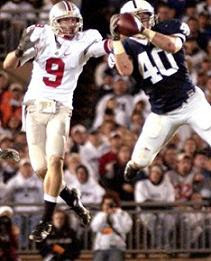 When one of the coaches was willing to take the ball on offense at that yard-line, he throws a flag or makes a signal. For example, one coach might think the twenty was acceptable, another might prefer to take it as far back as the fifteen. The Sabermetric site notes that this might actually get boring, because a consensus would emerge about what the yard line was. But I'm not entirely sure: wouldn't say, the Baltimore Ravens and Arizona Cardinals have different thought processes going into such an auction? One being defensive minded (and not likely to want to drive the entire field, but happy to pin the other team back), and the other likely to want the ball one way or another. But I could be wrong. Partially because as much as I enjoy these proposals they are unlikely to persuade the folks that need persuasion (the NFL Commissioner and his staff and the owners), so I support settling overtime by making the winner the first team to score six points. That would up the drama on those quick field goals, but also retains the penalty if the other team scores a touchdown on you. The biggest play of the Super Bowl to me (pick one!) was James Harrison's one-hundred yard interception return at the end of the first-half. It was not just a pick-six, it was a pick-thirteen (with the ball so close to the end zone, Arizona's expected points was around six, and the resulting touchdown was obviously a seven point play). Strategically it was also fascinating. The Steelers had been blitzing quite a bit, Warner thought it was a man-blitz, but instead Harrison dropped off into the passing lane. LeBeau has gotten a great deal of credit for this call, but at least some reports have been that Harrison was supposed to blitz but instead stepped back into the passing lane, after faking the rush. In any event, though you can't tell the exact nature of the defense (defenses are always compressed near the goal line, and even if LeBeau did call it, it could be man with Harrison dropping off as a spy or "floater," or if it was a true zone-blitz. But it does bring out something I want to highlight with zone-blitzes: zone-blitzes do not solely occur when a defensive lineman drops off into coverage. Indeed, the entire point of the 3-4 is that you can use a zone-blitz scheme without having to drop off ends and tackles; you can just change up the linebackers who come. Quite literally, it is anytime a team employs a blitz with a zone coverage behind it. Most "fire" zones use the end dropping off, but it's not necessary. Now, a common technique involves one often done by dropping defensive linemen, or by a player like Harrison: the step-up like a blitz and then drop-off. This technique is really independent of the scheme, but works well within it because it freezes blockers, thus making it more difficult to block the overload blitzes. This is how well-designed and executed zone-blitzes can get a free rusher with only five guys after the quarterback. While it might seem more interesting to limit zone-blitzes to situations where a big lineman drops into coverage, it is not accurate. Indeed, they are still revolutionary because typically blitzes are forced into man coverage because, to get the advantage in rushers versus blockers, they only have enough guys to go man to man or maybe man with one help player (usually a deep safety). The zone-blitzes try for the best of both worlds with a simple coverage (three intermediate, three deep) and a five-man blitz. They try to be effective by being well disciplined at both: using a matchup-zone or pattern read approach with the coverage, and scheming the five rushers to take advantages of weaknesses in the coverage. The good teams, like the Steelers, are dominant. But there's lots of bad zone-blitzing teams around. Zone-blitzing can sometimes be a bit like playing with fire.